We've been looking at 12 amazing Christmas products during this series, and now we're halfway thereWith the holidays fast on their way, we're getting excited for one of our busiest seasons at Bloomex, and celebrating with this series. On the sixth day of Christmas, my true love gave to me... six Christmas Red Roses. We know that there are lots of options out there for buying roses. That's why we offer the best value in Canada in terms of our flowers. 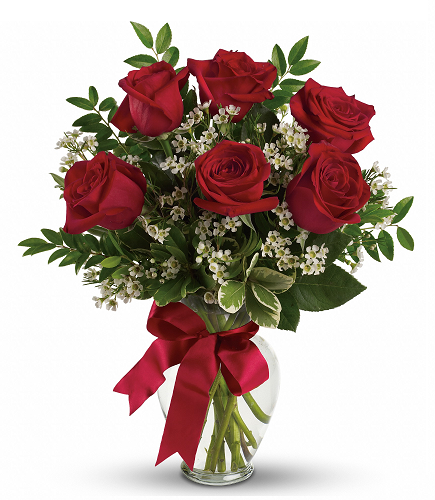 This bouquet of six red roses are perfect for the holidays. And for only $19.95, you can't beat the price. This rose bouquet comes with six fresh-cut, long-stem roses, adorned with stems of Tiki, Limonium, and fresh greens. Check out the product page here, and help them last their longest by reading some tips here. Say it for less with Bloomex this Christmas! Keep following along as we work our way through our 12 favourite holiday products, and catch up below. We've been looking at 12 amazing Christmas products during this series, and now we're halfway there. With the holidays fast on their way, we're getting excited for one of our busiest seasons at Bloomex, and celebrating with this series.